1. October 30, 1991: The Perfect Storm. President George H.W. Bush initiates Madrid Peace Conference, to consider Israel giving up "land for peace". As this Conference opens, a freakish "perfect storm" develops in the North Atlantic, creating the largest waves ever recorded in that region. 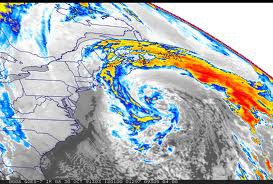 The storm travels 1000 miles from “east to west” instead of the normal “west to east” pattern and crashes into the New England Coast. Thirty-five foot waves crash into the Kennebunkport home of President Bush. 2. August 23, 1992: Hurricane Andrew. 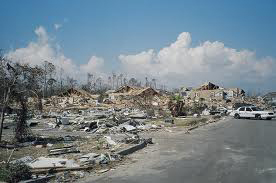 When the Madrid Conference moves to Washington DC and the peace talks resume, Hurricane Andrew, the worst natural disaster ever to hit America, comes ashore and produces an estimated $30 billion in damage and leaving 180,000 homeless in Florida. 3. January 16, 1994: Northridge Earthquake. President Bill Clinton meets with Syria's President Hafez el-Assad in Geneva. They talk about a peace agreement with Israel that includes giving up the Golan Heights. Within 24 hours, a powerful 6.9 earthquake rocks Southern California, This quake, centered in Northridge, becomes the second most destructive natural disaster to hit the United States, behind Hurricane Andrew. 4. January 21, 1998: Lewinsky Scandal. Israeli Prime Minister Benjamin Netanyahu meets with President Clinton at the White House and is coldly received. Clinton and Secretary of State Madeleine Albright refuse to have lunch with him. Shortly afterwards on that day, the Monica Lewinsky scandal breaks into the mass media and begins to occupy a major portion of Clinton's time. 5. September 28, 1998: Hurricane George. As Secretary of State Albright works on the final details of an agreement in which Israel would give up 13 percent of Yesha (Judah and Samaria), Hurricane George slams into the United States Gulf Coast with 110 mph winds and gusts up to 175 mph. The hurricane hits the coast and stalled. On September 28, Clinton meets with Yasser Arafat and Netanyahu at the White House to finalize this land deal. Later, Arafat addresses the United Nations about declaring an independent Palestinian state by May 1999, as Hurricane George pounds the Gulf Coast, causing $1 billion in damage. At the exact time that Arafat departs the country, the storm begins to dissipate. 6. 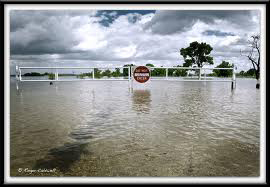 Ocotber 15-22, 1998: Texas Floods. On October 15, 1998, Arafat and Netanyahu meet at the Wye River Plantation in Maryland. The talks are scheduled to last five days with the focus on Israel giving up 13 percent of Yesha. The talks are extended and conclude on October 23. On October 17, awesome rains and tornadoes hit southern Texas. The San Antonio area is deluged with rain. The rain and flooding in Texas continue until October 22 and then subside. The floods ravage 25 percent of Texas and leave over one billion dollars in damage. On October 21, Clinton declares this section of Texas a major disaster area. 7. November 30, 1998: Market Capitalization Evaporates. Arafat comes to Washington again to meet with President Clinton to raise money for a Palestinian state with Jerusalem as the capital. A total of 42 other nations were represented in Washington. All the nations agreed to give Arafat $3 billion in aid. Clinton promised $400 million, and the European nations $1.7 billion. On the same day, the Dow Jones average drops 216 points, and on December 1, the European Market had its third worst day in history. Hundreds of billions of market capitalization were wiped out in the U.S. and Europe. 8. December 12, 1998: Clinton Is Impeached. As Clinton lands in the Palestinian-controlled section of Israel to discuss the “land for peace” process, the House of Representatives votes four articles of impeachment against him. 9. May 3, 1999: The Powerful Super Tornado. On the day that Yasser Arafat is scheduled to declare a Palestinian state with Jerusalem as the capital, the most powerful tornado storm system ever to hit the United States sweeps across Oklahoma and Kansas. The winds are clocked at 316 mph the fastest wind speed ever recorded. 10. August 29, 2005: Hurricane Katrina. One week before Katrina made landfall, Israel carried out the evacuation of 9,500 residents from Gush Katif and four Samaria communities. Residents were forced from their homes by Israeli troops, some dragged away kicking and screaming and placed on buses that took them from the area. The Gaza withdrawal was backed by the U.S. government. Some Middle East analysts and senior Israeli politicians entirely attributed the evacuation plan to pressure coming from the American establishment. Of course, those who subscribe to these "coincidences" might see the hand of God. We Christians know that the land of Israel is holy and the Jewish nation is God's chosen people. But if you can't go that far, perhaps you can at least admit that America's destiny seems to be inexplicably tied to the fate of Israel, or at the very least to the Freedom foundation of this country. And to apply this analogy to current events, consider this: Did you see the connection between the SCOTUS decision last Thursday and the freakish thunderstorms in the East that caused hurricane-like damage, killing at least 13 people and causing millions of dollars in damages? Is it just "chance" that Washington D.C. is suffering under an unprecedented heatwave and power outage? Combine that with the censoring of Attorney General Holder and the Colorado wildfires, and it doesn't seem too outlandish to think that the dismantling of our Constitution and the corruption in our government are tied to these natural disasters. Those of us who study our Bibles are familiar with this "cause and effect" chain of events whenever God's people rebel against Him. It's always seemed like it was part of the Bible's history. But why would it be any different today? Has God changed? Never! 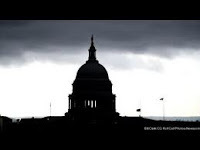 So whether you see a connection between our governmental policies and these forces of nature, you must surely see that the fortunes of America are slipping. Is it God's judgment? I am not qualified to answer for Him. But I know this ..... I would rather put my faith in Him than any Authority on earth. Malachi 2:2 "If you do not listen, and if you do not resolve to honor my name,” says the LORD Almighty, “I will send a curse on you, and I will curse your blessings. Yes, I have already cursed them, because you have not resolved to honor me." Very interesting post this morning. My pastor has taught for years that America is under the cycles of discipline not to scare us but to make us understand how important bible doctrine is in our lives. As goes the Christian so goes the nation. If more churches had pastors like yours, this nation might truly repent and God would hear our prayers and heal us. But too many churches are preaching the Gospel of Grace without calling Christians to repentance. And you are so right .... Bible doctrine is so important! Newest case in point: The super storm, the derecho, seemed to hit Washington, D.C. with the most force, continued power loss, and record-breaking temperatures. This all occurred after the Supreme Court upheld the Affordable Care Act, Obamacare, which contains so many provisions that are so Godless. May God have mercy on our country, and may we as a nation humble ourselves and turn back to Him. Yes, I saw the same connection, as I mentioned in my post. And doesn't it seem as if these natural disasters are coming faster and faster, and closer together? Is this the time God will finally remove His hand of protection? May I ask you where you got this information (or, perhaps, you did the research yourself)? It's very interesting. I would like to use it for a speech, so it would be nice to have the original source. I first heard many of these in my Sunday School class, and then followed up with further research. This link will give you more details: http://www.truthorfiction.com/rumors/t/tenmajorevents.htm#.UQhDbY7iNUQ. It's fascinating, isn't it? Here we are 2015 and Netayahu is going to speak to Congress and Obama is fuming and has sent a team to Israel to influence the election. I am waiting for a market "adjustment" that is going to be very painful.